Hello, everyone. (Anyone?) It has now been just over five years since our first post—written on December 20, 2006—and since then we've logged and chronicled more (way more!) than a thousand images of animals delighted to be killed, and sometimes despoiled and tortured, for you. Our goal when we started the Suicide Food blog was to reveal just how horrifyingly absurd (and repetitive!) meat culture is, and just how much it depends on bizarre beliefs for its legitimacy. We envisioned an endless catalog of marketing strategies, an eternally unspooling record of a subculture's tastes, dreams, and drives. We have now amassed the Internet's foremost clearinghouse of suicidefoodist imagery, not that the competition was exactly fierce. But we've reached our limit. Oh, there are more shills out there. The world will never run out of animals living for their chance to die, animals who find their highest calling in the mad dash for death. Our files are stuffed with literally hundreds of unused images, with more uncovered or emailed to us all the time. But we're done. We're hanging up our scolding cape. We can't say whether this is a permanent retirement or just a sabbatical. We might be back in a week. Or a month. Maybe we'll adopt a lackluster once-a-week posting schedule. We might pop in from time to time with especially vile specimens from suicidefoodism's wretched workshop. Or we might just slink off to embark on another grand/stupid obsession. We still invite your contributions. If you'd like to explore the archives, click on the "suicidal tendencies" in the list to the right. The "5 noosers" are always good for a cringe. And the link below "from the case files" directs you to a randomly selected post with every click. Until we see each other again, keep looking to the stars suicidal animals. 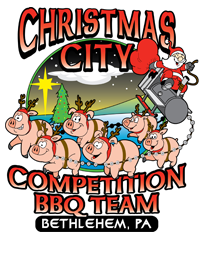 It's a Christmas tradition in these parts: Santa hitches the flying pigs to his magic barbecue and takes to the skies. At every house they pass, Santa frees one of his wonderful pigs, who tumbles down the chimney, incinerating himself in the fireplace. Oh, don't worry! These are miracle pigs; they regenerate endlessly, until every home on Earth has a dead pig of its own! Which is why the pigs are every bit as jolly as Saint Nick. On this night, they get to die eternally (well, a billion or so times each), again and again, reconstituted above the rooftops and readied once more for death. Take a moment to visit the ghosts of suicidefood Christmases past—2010, 2009, and 2007. Things are different in Australia—profoundly, mystifyingly, adorably, offputtingly different—so there's no reason this should startle us. 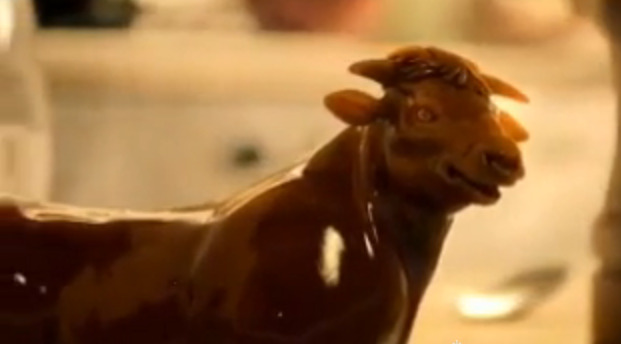 Because, to demonstrate the agreeable flavor of their meat-based food moistener, the Colman's Instant Beef Gravy people have introduced us to a beef paste-born bovine reincarnation springing forth from his sacred gravy boat. Look at him, freed from Death's grim shackles, leaping above the table top, destined to splash himself all over your plate! Of course, it's only what any right-thinking animal offered a second chance at life would seek out: not escape, but a quick trip back to the conveyor belt of consumption and nothingness. Thus has suicidefoodism ever represented it. So eager are the animals to die that their most numinous vocation is not to die once, but to return to life to die again. The second death is sweeter, surely, because they rush into it with eyes open. Having already savored their own destruction, they hasten back to their utter negation, the no-time and no-place where they are finally at home. 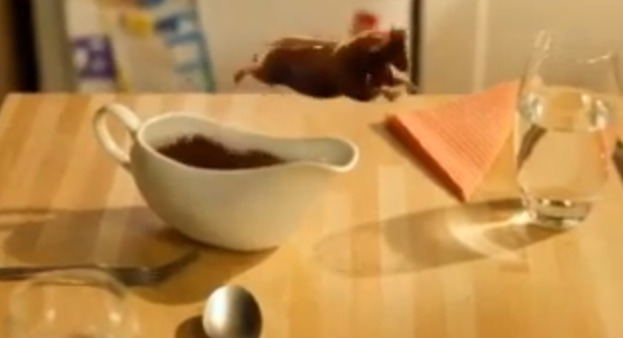 And so Zombie Gravy the Bull soars. He cavorts and poses. He dances and sings. And what a song it is! For reasons we can't begin to explain (no, not even with all our big words and pointy-headed ideas), he croons "I like the way you moo!" He likes the way we moo? (We weren't aware we were mooing.) But you try arguing with a reanimated bull made of gravy. See the whole thing for yourself. Our subject this time around is Baxter, the Pig Who Wanted to Be Kosher (Tricycle Press, 978-1582463155) by Laurel Snyder, illustrated by David Goldin. 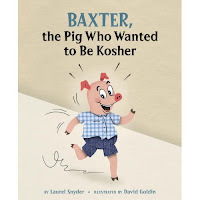 "Baxter desperately wants to experience Shabbat dinner, the special Friday-night meal that ushers in the Jewish day of rest. [...] When he learns that pork is a forbidden food according to Jewish law, he stuffs his face with kosher pickles and raisin challah, hoping to become kosher. He even tries, unsuccessfully, to become a cow." And you're surprised that suicidefoodism lingers? That it spreads like illness? That it lurks in the forgotten corners of the cultural hive, waiting waiting waiting to regroup, to regrow, to re-emerge and conquer! Baxter—dear, foolish Baxter—wants so badly to experience everything the humans experience that he thinks nothing of attempting to make himself edible. The adorable string of misadventures he embarks on have at their center a trusting pig's desire to make himself the centerpiece of their holiday celebration. Not, you understand, to finagle an invitation, but to make his very flesh suitable for his hosts' consumption. Compare if you will the name Pleasantville with the gruesomely spot-on barbecue-related town names we've seen in the past, like Boiling Springs Lake and Hardball Farms. While those toponyms put it all out there—the pain, the anguish—Pleasantville is coy. Pleasant. Does this look pleasant? 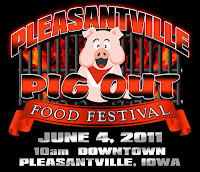 The pig in his barbecue grill jail, the flames swelling at his back—that's pleasant? Well, for him, it probably is. We lost our heads for a minute. This isn't one of our scheduled Festivals of Cruelty, wherein the animals are truly terrorized and hounded to the brink of death and beyond. This is party time. The animals are honored guests, proud for the chance to die and experience the oblivion they've spent their lives pursuing. 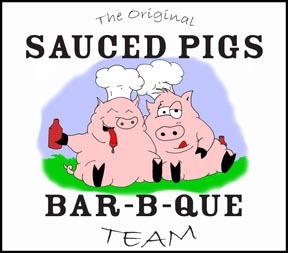 These two pigs are sauced, you see—drunk on the glory of their impending deaths. They're also sauced, as in slathered with flavor-enhancing goop. Either way, we can see they're feeling no pain. (That part comes later.) Right now, it's all about camaraderie, happy wishes for an eventful future, and the profound satisfaction that comes from fulfilling one's dearest wishes. That they can experience their blossoming present and fructifying future together is icing on the cake. Or more like barbecue sauce on the hunk of pig meat. Of course, the one on the right looks like he's had a touch too much camaraderie and reminiscing about the paltry pleasures of living. 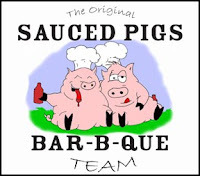 Addendum: More sauce-related wordplay, this time courtesy of a decapitated pig head wreathed in a bandanna of fire. The jerky pushers puzzle us. Yes, all the True Believers, the Willing Sacrifices, the Kill-Me-Nows, the relentless martyrs—every self-peddling beast puzzles us. But for some reason, the pre-jerky animals (along with the pre-rinded pigs) just baffle us and give us the shivers. There's something about the time investment implicit in the jerky-making process. Big John knows it's not simply a matter of killing himself and trusting that he will make it into the waiting mouths of his superiors. He has to rely on a more extensive procedure. There's the defatting, the marinading, the seasoning, the dehydrating, and the packaging. It'll be a while between his sweet death and his sweeter consumption, which is sort of a superdeath, the irrevocable made thoroughly unimaginable. He has to be completely committed, and that level of certainty is a little off-putting. One other thing strikes us about Bovines Who Would Be Jerky. As far as we can tell they are almost always hyper-masculine characters. Take the Rosie's Vermont Beef Jerky spokesjerk—the burly lumberjack we met almost five years ago. These animals are the manliest of the manly: muscle-bound, tuxedoed, boxing gloved, or bedecked in backwoods plaid. Like the foodstuffs they are destined to become, they are tough. 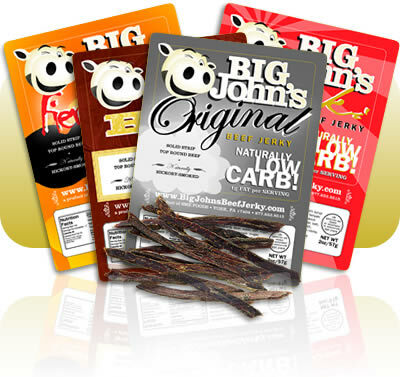 Whether this reflects the aspirations of the jerky consumer or the essential nature of the animals in their benighted (i.e., living) form, we can't say. 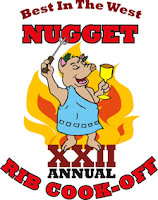 The rib cook-off is finally given its due! Ensconced within the classical tradition, the rib cook-off can at last be seen as the honorable institution it has ever been. The pig in his cerulean toga and his laurel wreath signifying high birth and virtuous deeds readies to open the games and make merry. I come to eat this here pig, not to praise him. Blah blah blah. Yeah, that's all very artsy-fartsy and everything, but maybe you should just listen to the pigs and start eating. Civilization depends on obeying the pigs' wishes. 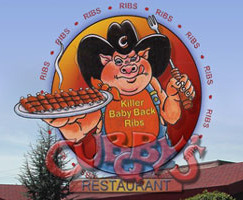 Angrily, he endorses his eponymous line of "killer" pig ribs while angrily holding aloft a killer barbecue fork. We're not sure what Cubby's got to be so angry about. After all, he's orchestrated this entire enterprise according to his own scheme. If he doesn't like it, he could just leave the gigantic cowboy hat behind and assume a life of quiet dignity. So we know he's right where he wants to be: hawking ribs by the platterful, in the hopes that one day it'll be his ribs up there. Maybe that's what's got him so mad, the knowledge that it's always someone else's turn, some other pig's chance to sacrifice his meat and bones for the "good" of humanity. What about Cubby? When is it his turn? He has a restaurant, he has standing in the community, he has a set of custom-made overalls. So why not him? In time, Cubby. In time. Until then, content yourself with the thought that your anger is the secret ingredient that'll make you one memorable meal. 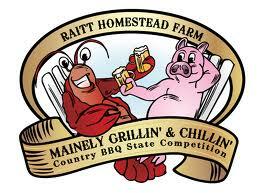 Lobster: Say, when you think about the Raitt Homestead Farm's Mainely Grillin' & Chillin' Country BBQ State Championship, what's the first thing that comes to mind? Pig: Hard to say, Lob. I guess the grilling? Or maybe the chilling? Lobster: They're both important aspects of the G&C festivities, that's for sure. But aren't you forgetting something? Lobster: Come on, Pig. What's the best part? The Reason for the Season? Lobster: There's the grilling. The chilling. And the...? Lobster: Now you got it! Pig: If it weren't for us getting killed, none of the rest of it would be worth a darn. Pig: And the spilling. Spilling our blood? Pig: And the willing? Like, making out your will? Lobster: Yeah, but it's not like we own anything to give away. It's borrowed time all the way! We can't even claim ownership of our bodies. Pig: There's the Adirondack chairs, too. Can't forget them. Lobster: They make the chilling so much easier. There once was a pig. 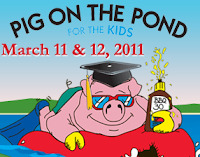 There was a pond, too, but we're interested in the pig. The pig had a dream. Unless you're three weeks old, you already know what the pig's dream was. The pig's dream was to get eaten. If he could bob around on an inner tube for a while beforehand, that would be gravy. So, the pig did what any pig with a purpose would do: He dedicated himself to the quest for culinary knowledge, enrolled in a pig-fattening class, and got himself fitted for a pair of swim fins. All the pieces were falling into place. As he drifted off to sleep every night, he warmed himself with thoughts of his future, a future that offered itself to him like a big old plate of pig meat all dripping with, you know, "juice." And after all that work… nothing happened. 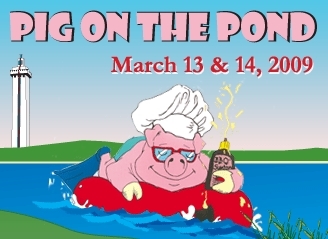 The pig floated from one end of the pond to the other, and no one so much as stabbed him with a fork. Now, the average pig would have been so discouraged he might have given up completely on the idea of being killed and eaten in a superfluous festival of carnivory. But this pig was no average sacrifice. No, he redoubled his efforts. He got himself an advanced degree in Dying Studies and tried again. Slathering himself with BBQ 30 (ha ha? ), he mounted his inner tube and took to the pond once more. Who could resist such an educated pig? He had achieved the pinnacle of academic excellence! He had finally become somebody. Just in time to become nobody. For our money, any chicken who can manage to grow sideburns has earned the right to make crummy decisions about his own life. Like Griff here. 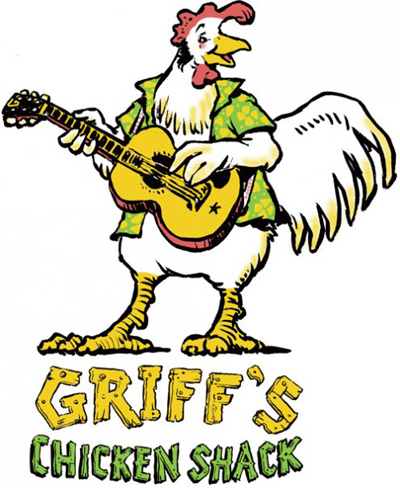 He's not just a finger-pickin', guitar-strummin' bird. He's also the proprietor of his own shack as well as a main dish. He'll just keep on crooning and wailing and offering up his wings and legs for the deep fryer. That's the performance that really matters. 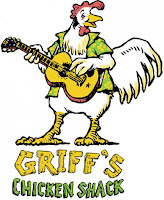 Addendum: Griff's rockabilly vibe calls to mind the celebrated Elvis/Pork Nexus and this rocking and rolling chicken. We can't be sure, but Uncle Piggy sure seems like a pig with a terrible secret. And then there's his, well… His personal issues. It's not exactly well known outside the world of suicidefood, but cannibalism and his own impending demise have joined forces to inflame inside him an unquenchable paraphilia. His shirt's already off, and he crosses his legs provocatively. He wants you to want him. 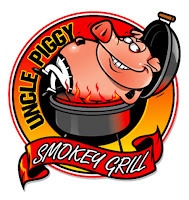 He is making bedroom eyes at you from atop the grill. Oh, he'll make you cry Uncle. And with that, we're off to see our therapist. Until next time! Do you know what makes fish happy? Swimming, maybe? Spawning? Satisfying other crude biological imperatives? Maybe it's the simple act of being, of possessing a functioning body, of existing as an example of life, colorful, beautiful, graceful, a scintilla amid creation's great dazzle. Or maybe you don't believe fish are the sorts of things that can experience happiness? Well, both views are wrong. 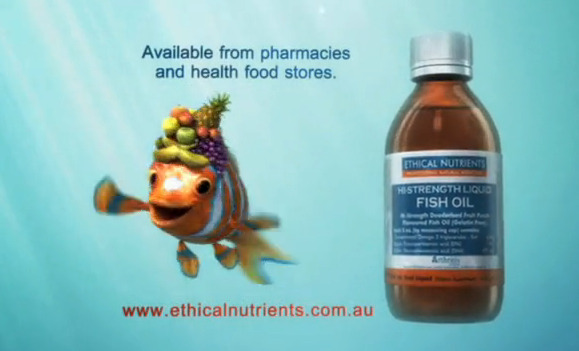 What makes fish happy—very happy—is peddling fish oil for people to take by the spoonful. It makes them (the fish, not the people) dress up in Carmen Miranda drag and give in to life's clarion call: Dance! Make merry! Shake your fins and die!